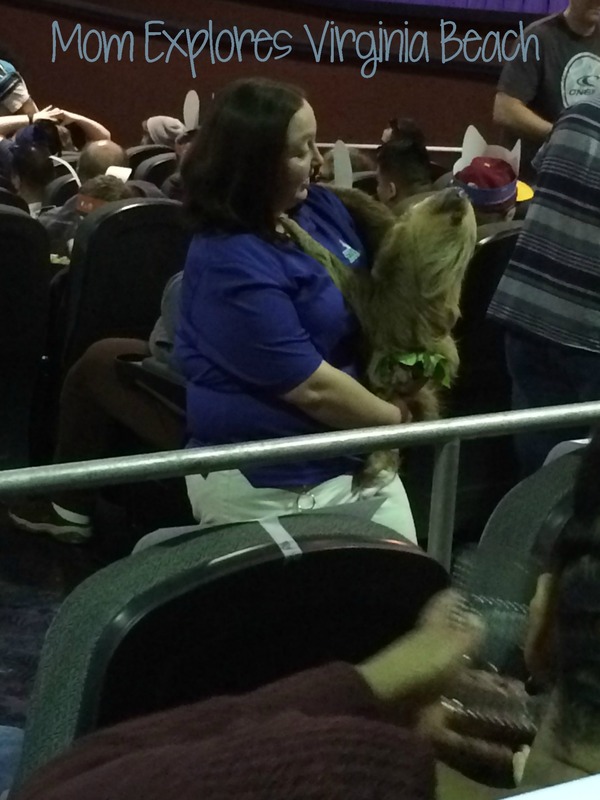 I had the opportunity to attend a screening of Disney’s newest movie, Zootopia. 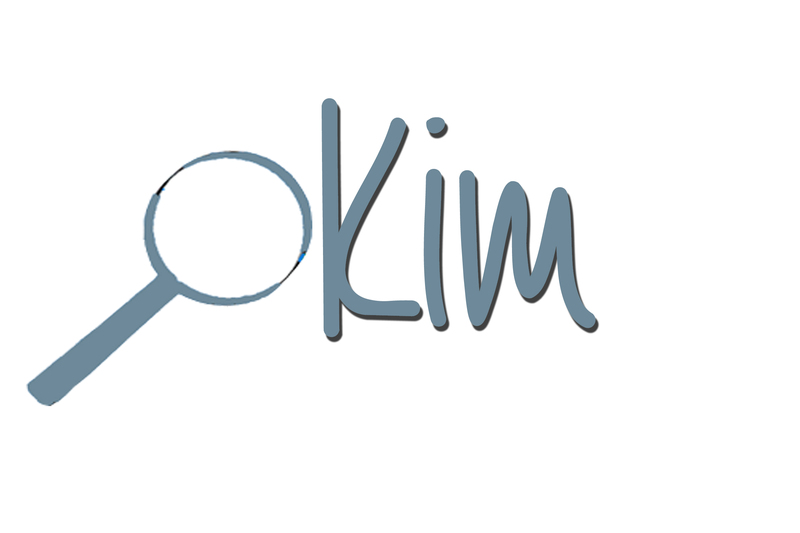 I am so excited to share my experience with you! 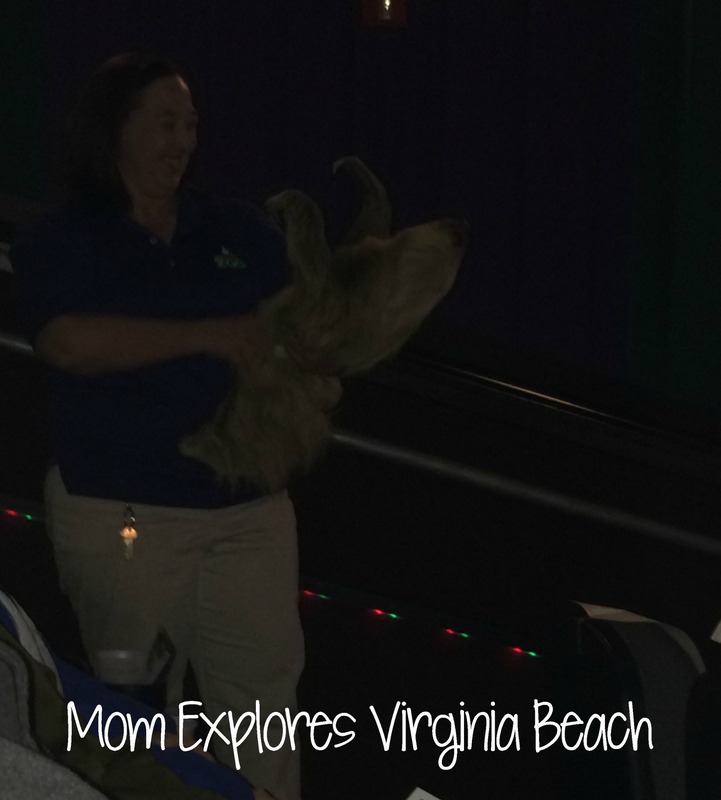 Disney partnered with the Virginia Zoo to offer this pre-screening, and they brought along a few friends from the zoo, including a sloth! There is a sloth character in the movie, Flash, so it was especially exciting to see one live! A few shots of the 36-year-old sloth touring the movie theatre. Now before we jump in, I have a confession. You can tell I’m the parent of a toddler because this is the first movie I’ve seen in a theatre since before the birth of my son. 3 years ago. I’m not joking. Also, this was the first movie I’ve seen in 3D! Also, not joking. When you’re done laughing, please continue reading. This movie was about a bunny from a small town who wanted to move to the big city, Zootopia, in order to become a police officer. In this modern society, many species of animals live in peace together, there are no longer predators and prey. There had never been a bunny as a cop before, so she had to work extremely hard to become an officer and even harder to be taken seriously. She takes on what seems like an impossible case to prove she earned her spot in the Z.P.D. As a crime TV fanatic, I can tell you this movie has something for everyone! I was totally sucked into the plot of the film, and forgot I was even watching cartoon characters. It seemed like an episode of Law and Order and I couldn’t wait to find out what was going to happen next. I was concerned it might even be too “adult” for kids to follow the storyline. But the characters are engaging and funny, so children would definitely be entertained throughout the film as well. All the kids in the theatre were giggling and enjoying themselves throughout the flick. This is truly a film for the entire family to enjoy. One of the elements that made it so easy to get wrapped up in the film was the superb animation and attention to detail put into the 3D elements. You could see individual strands of fur and drops of rain. It’s truly amazing how realistic this animated film is. I think I just found a new favorite Disney movie! 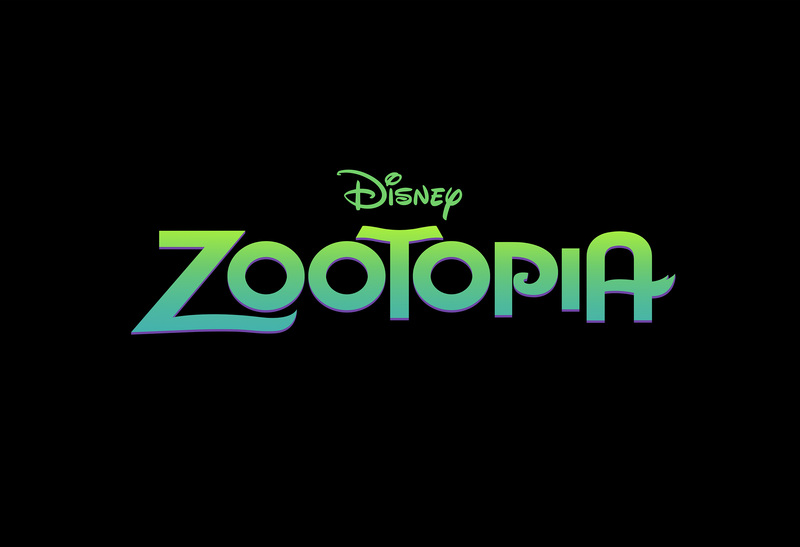 “Zootopia” is Walt Disney Animation Studios’ 55th animated feature. Artists crafted six unique outfits for Assistant Mayor Bellwether. The chosen fabric, naturally, was wool. Her outfits include a houndstooth dress, a blazer and a little bell in honor of her moniker. She also has an orange dress with a scissor pattern that represents shears. Artists were inspired by Mufasa from Disney’s classic film “The Lion King” when creating the look of Mayor Lionheart. 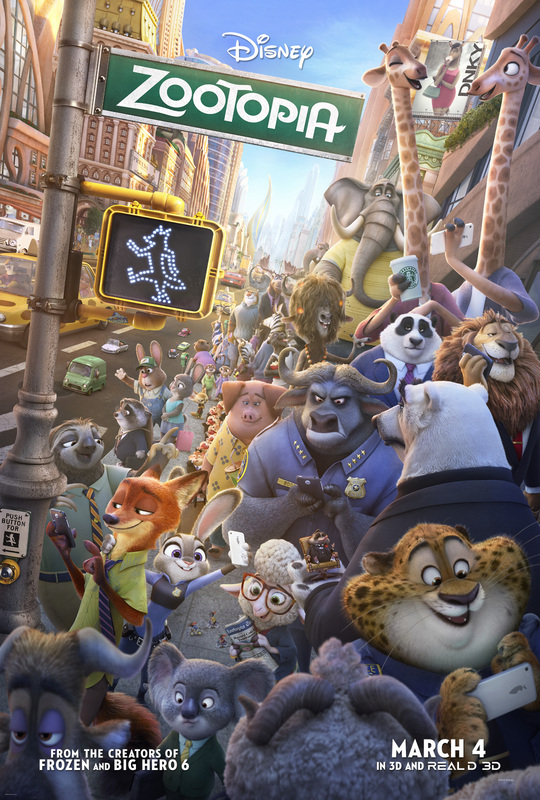 While researching the variety of animals that would inhabit Zootopia, filmmakers learned that not all fur is the same. A strand of polar bear fur is clear—it’s the light reflecting off of it that makes it appear white—and a strand of fox fur is dark at the root, getting lighter till its red tip. Artists strived to replicate their findings to ensure that the animals in “Zootopia” were believable. When artists realized that real rabbits actually have a split upper lip, they decided to forego authenticity in this case and kept Judy’s lip all together. I am sharing here some printable coloring sheets displaying some of the characters in the movie, as well as a matching game (match the footprint to its animal). I encourage you to go see this movie, coming out this week! March 4, 2016. Enjoy! And of course, come back and let us know what you think! Omigosh I totally love sloths!! I so wish I could have been there to meet the sloth from the VA Zoo. They are so cute! How did Jonas like it? Me and Jack can’t wait to go see Zootopia! I think we saw a trailer for it back last summer and we’ve been anxiously waiting for it since! The sloth was so cool! He was just hanging out with the keeper the whole time, very calmly! Jonas actually didn’t come along, I’m not sure he has the attention span to sit through a movie, yet… :/ But my husband and I totally enjoyed it! When it comes out on video, we will watch together at home! I can’t believe they brought animals! How cool! It was really neat! I wasn’t interested in getting too close to the snake, but the sloth was awesome. I somehow missed this post. How totally fun! We haven’t taken Maggie to see a movie yet- so I completely understand not being at the theaters in awhile. I can’t wait to see this movie!! So I took Jack yesterday after preschool with 2 of his lil buddies from school and their mom and grandma and papa and younger brothers…it was a whole gaggle of us! We stormed the Cinema Cafe and pigged out on pizza, french fries, and popcorn while we watched Zootopia! The boys had a blast! The two little ones held up pretty well throughout movie. Us adults enjoyed the movie as well…super cute movie! The animation is phenomenal…at times the scenery looks completely real! 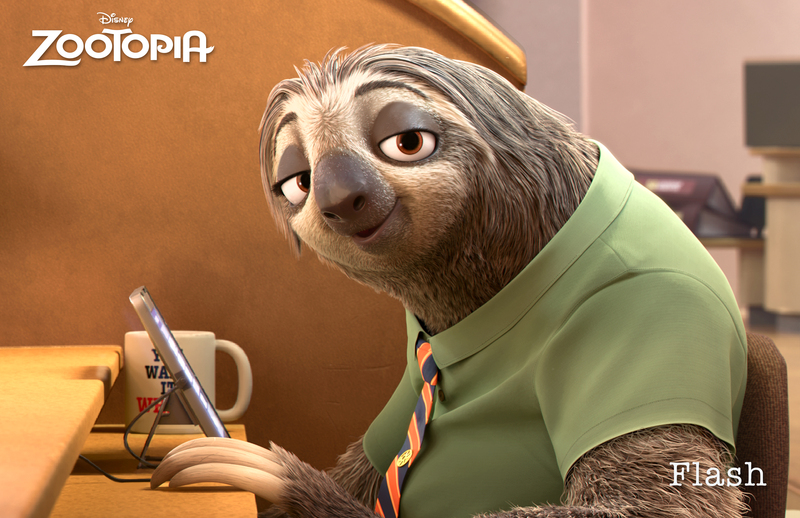 Flash the sloth was a total scene stealer in the movie and you just can’t help but love Judy and all her toughness! So glad you all enjoyed it as much as we did! The graphics were amazing!